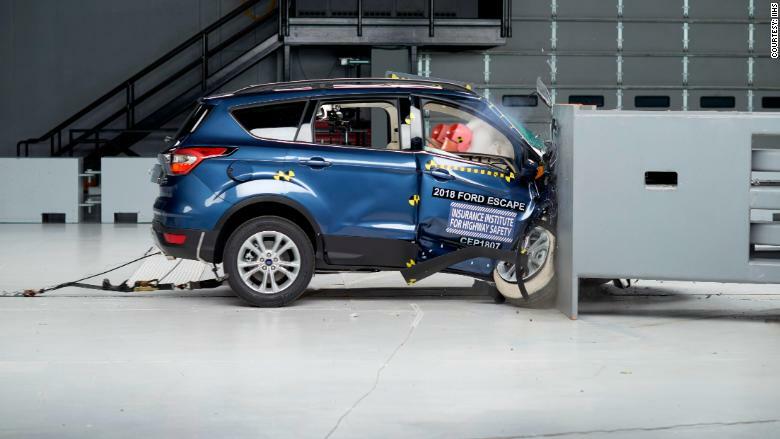 The Ford Escape SUV earned a "poor" rating in a crash test designed to show how well front-seat passengers are protected in a violent collision. It was the only small SUV in a group of seven tested to fail the test. The Insurance Institute for Highway Safety's new passenger side front crash test is, literally, the flipside of a test the Institute has been doing for five years on the drivers side. In that test, a vehicle is propelled at 40 miles an hour and strikes a barrier with just the outermost part of the bumper on the driver's side or, in this case, the passenger side. The small overlap test is designed to mimic the impact of a vehicle with another car or a tree or pole, with just the outer part of the bumper. It's a particularly violent and dangerous type of collision. The Escape had earned a rating of "acceptable" when the small overlap test was done on the driver's side. That was thanks to reinforcements Ford had added to that side of the vehicle starting in the 2017 model year. But Ford did not add those reinforcements to the passenger side, according to the Insurance Institute. In the passenger side test, the Escape's cabin was crushed much farther inward and side airbags did not deploy, as they have in other vehicles subjected to the same test. 2018 Ford Escape undergoing the Insurance Institute for Highway Safety's passenger side small overlap crash test. "Disparities like this one are why we decided to formally rate the passenger side in the small overlap test after five years of evaluating only the driver side," said Becky Mueller, an Insurance Institute research engineer who helped design the test. The Insurance Institute for Highway Safety is a private group financed by the auto insurance industry. Ford (F) pointed out that the Escape has earned high marks in all other government and Insurance Institute crash tests. "Safety continues to be one of the highest priorities in the design of our vehicles," the automaker said in a statement. "We are committed to designing and building vehicles that meet or exceed applicable laws and regulations across the globe, incorporating updates and new features into our lineup wherever possible." The Escape's results were released by the Insurance Institute Wednesday along with those of six other small SUVs. Five of them, the BMW X1, Jeep Compass and Mitsubishi Outlander along with the Chevrolet Equinox and the closely related GMC Terrain, earned "good" ratings, the best possible. The Mitsubishi Outlander Sport, which is smaller than the Outlander, earned a "marginal" rating. Only the Escape earned a "poor" rating.